I'm in the beginning stages of either purchasing a used 4-lane 35' Besttrack or possibly a new one for the pack. Looking at the Besttrack website they have champ timers, GPRM software & various accessories such as extra stop sections, lift/level kits etc. What items are needed for a ready to run track set up? Obviously the track but are Champ timers the standard? Do I need a leveling kit? Are the supports for the starting area included? Is one stop section enough? Any recommendations are appreciated. JSG wrote: I'm in the beginning stages of either purchasing a used 4-lane 35' Besttrack or possibly a new one for the pack. Looking at the Besttrack website they have champ timers, GPRM software & various accessories such as extra stop sections, lift/level kits etc. 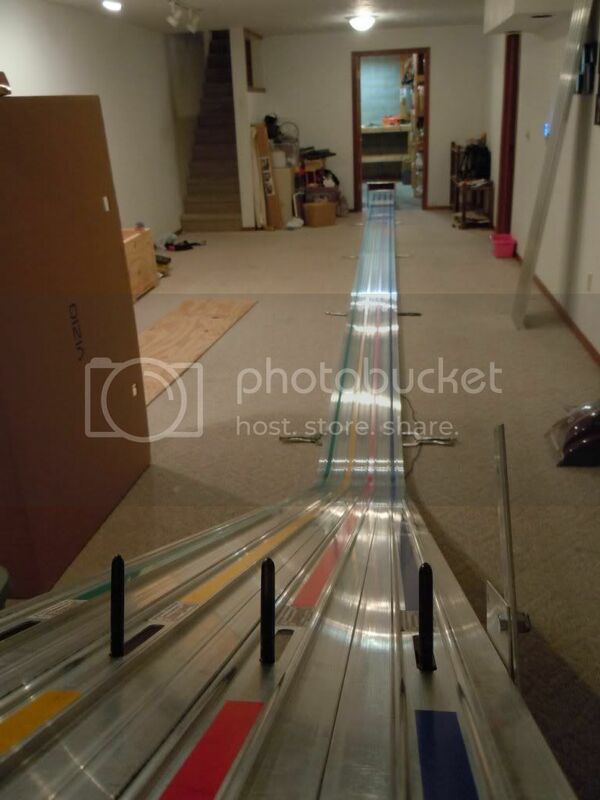 What items are needed for a ready to run track set up? Obviously the track but are Champ timers the standard? Do I need a leveling kit? Are the supports for the starting area included? Is one stop section enough? Any recommendations are appreciated. You can't go wrong with a Best Track. Obviously with a four lane you'll want a timer, and Best Track would like you to purchase there timer, but they incorporate other holes in the track for other timers that are out there. It's a great timer and there isn't anything out there like it. With it's Aluminum case to keep all the electronics safe at all time. Quality is top notch just like the track. GPRM is the software of choice and as far as "I" know it's the best. The supports for holding the ramp up are part of the deal, and only sub-3 second cars on a 42' track go fast enough to go beyond one stop section. Thats why you'll see the pros have two. With a 35' track not so sure you'll need one. But if you do see one go beyond it's much cheaper to lay foam or a pillow at the end. 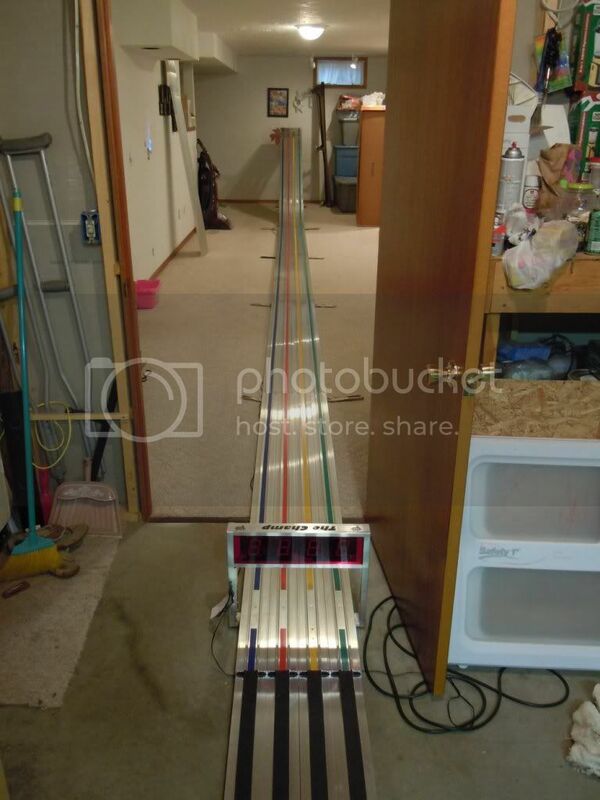 I have a 42' 4 lane Best Track with a Champ Timer and GPRM software. I dont have the leveling feet, it would be nice to have but not a necessity. We just went through this same process with three Packs that divided up the cost and then purchased a new track along with new timer and software. Check your PM and I'll share the recommendation letter they went from. Thanks for all of the replies! They really do clear some things up for me. rpcarpe, We have 4 Cub Scout packs in our school district. The pack that we used to be in just bought a new aluminum track. Not sure what brand. I wish we would have communicated more and set up a co-op like you mentioned. He offered us their old home-made wooden track for $300.00 but I don't want to go down that bumpy road again. We have had a friend from another pack run our race for the last 2 years but as the kids age out it's harder to arrange that. I thought about asking the pack that just bought a track to run our race next year for a fee but part of me wants to buy our own track so we aren't relying on others to help us out. Our pack has a 42' Best Track that is only 1.5 years old and it has run 2 pack races for us now. It is a 4 lane and we got the Champ timer to go with it and the option to display times on the timer. Very happy with the quality of the track and timer. When combined with GPRM software, I think you have the "best of the best". Our pack ended up purchasing the "lift / leveling kit" for the track. There are "pros and cons" to that option. the pros are that you can easily level the track and adjust for floors that are not quite level. Another pro is that it helps the audience see the cars and timer better, because everything is up in the air about 2 1/2 feet. The only con I saw is that if you ever have a car that comes off the track (and eventually you will, due to no fault of the track), that car will likely have a 2 1/2 foot drop to the ground which can cause more damage than if the flat part of the track was at ground level. Next year I'd like to add an automatic start gate and a light tree. Will be starting research on that project after District races complete in April. Good Luck and may all your races be fun ones!